An angry McDonald’s customer who thought he was being ignored by workers flew into a tantrum at the store before returning later to beat the manager with a baseball bat. 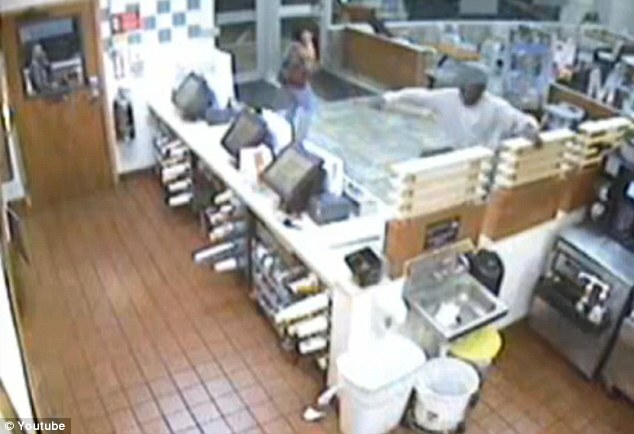 The incident occurred on Sunday at a McDonald’s restaurant in Lakeland, when a customer waiting on line to order was somehow over looked by the staff. The Lakeland Police Department said in a statement that the man became aggressive and told the manager that the same thing had happened to him the day before. 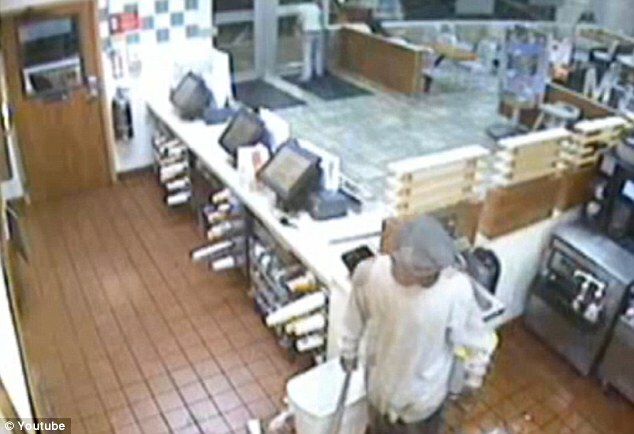 The suspect demanded the number of the McDonald’s corporate office, which the manager wrote down for him – but the suspect then threw down the paper and left. But police said the McDonald’s staff hadn’t seen the last of him, as he returned about 20 minutes later, this time with the bat. 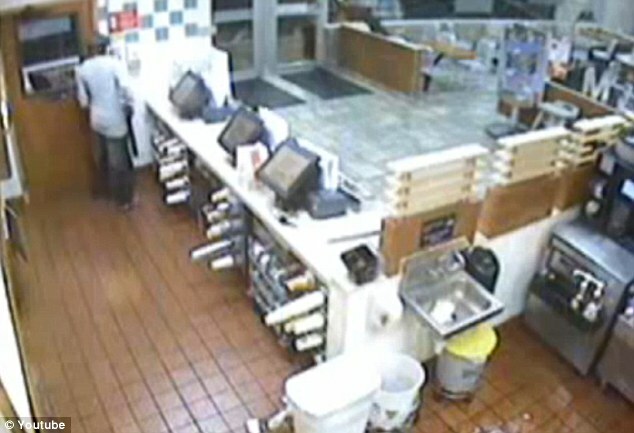 Security video taken from the restaurant shows the suspect hopping the counter and menacing the bat as he approaches the manager. But the actual attack is not seen on the video as the suspect jumps out of the shot for about eight seconds. He then calmly leaves the store, tucking his hand through his sweatshirt to avoid leaving fingerprints on the door handle – and apparently forgetting that he placed his bare hands on the counter as he jumped over it. A female 911 caller reported that the suspect said: ‘Just give me some f****** food, you cracker’ as he hit the manager with the bat. 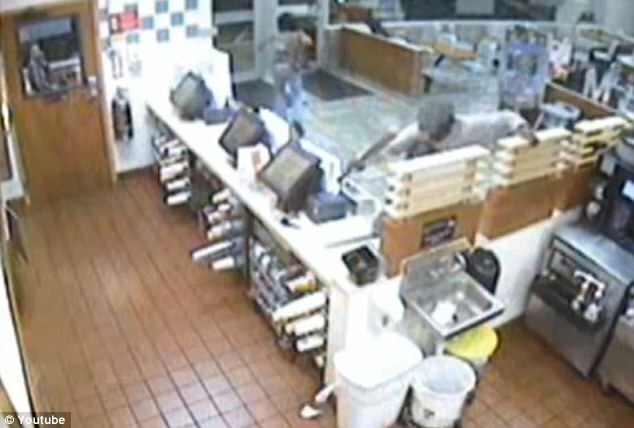 The caller, who identified herself as a McDonald’s worker, said she saw the manager holding his side after the assault. Police originally classified the crime as a robbery, but are now calling it assault and battery as an investigation showed the suspect was not looking to rob the store. At this point, officers have not yet been able to identify the attacker. The suspect was described as a black man in his late 30s, wearing a grey sweater, jeans and a grey hat. 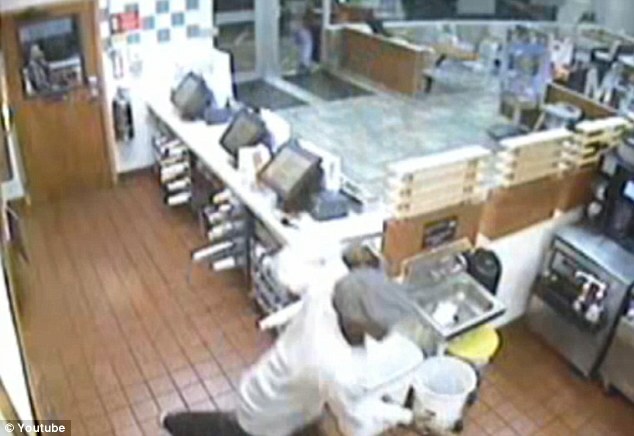 The McDonald’s manager was treated for non-life-threatening injuries to his ribs at a nearby hospital. 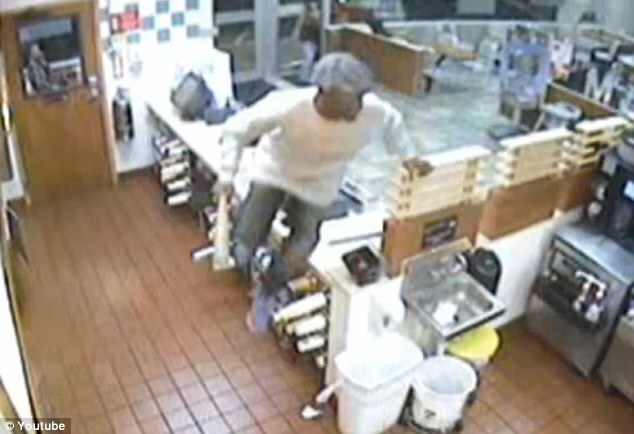 Getaway: As the suspect leaves the restaurant, he tucks his hand through his sweatshirt to avoid leaving fingerprints, apparently forgetting that he placed his bare hands on the counter as he jumped over it.